Infectious guitar-driven, melody-laden, alternative power pop rock with upbeat songs, inspirational lyrics and spiritual overtones. 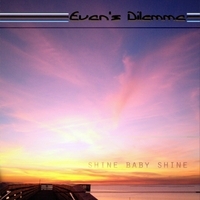 Shine Baby Shine, the 2006 debut album from Evan's Dilemma has major-label quality production with a raw intensity still only found in an indie band. Eleven amazing songs with melody, passion, harmonies and crunch. A must have album for power pop / rock / alternative fans. Evan's Dilemma's original guitar-driven power pop/rock takes influence from both classic and newer artists such as Big Star, Husker Du, Bob Mould, Sugar, The Replacements, U2, Beatles, The 77's, The Neighborhoods, REM, Goo Goo Dolls, Midnight Oil, Matthew Sweet, Weezer, The Cars, Oasis, The Pixies, The Cure, XTC, The Smiths/Morrissey, Peter Gabriel, Paul Simon, The Church, The Choir, Coldplay, Tears For Fears, Rush, Switchfoot, Green Day, Coldplay, Foo Fighters, The Beach Boys and Brian Wilson, etc. Recorded at : OMG Studio 6 in Greenville, SC Jan. - Mar. 2006. Pre-production Jan. 2005-Dec. 2005.